"Okay Yui you’re scaring me now!" Isn't it always the case that trifling little things like work and studying get in the way of fun? Death, taxes and whatnot. 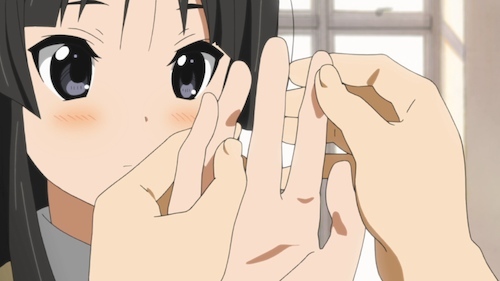 In this epicly cute episode of K-On! we're reminded that these people are actually at school and have little things called mid year exams to prepare for, not just their club! I thought it appropriate I talk about this particular episode when I'm supposed to be doing homework. Sorry girls, you ain’t got nothing on the Bakemonogatari campus! 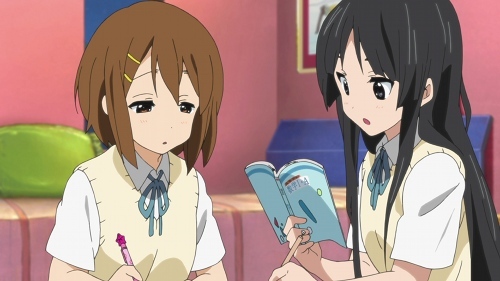 Anyway there's one small problem with all this preparation and practise, her long time friend from kindergarten Nodoka reminds her she actually has to study for these things called midterm exams. In typical Yui fashion she smiles and nods in response to this, only to have it settle and dawn on her several long seconds later. Ah that's nice… wait we have WHAT? 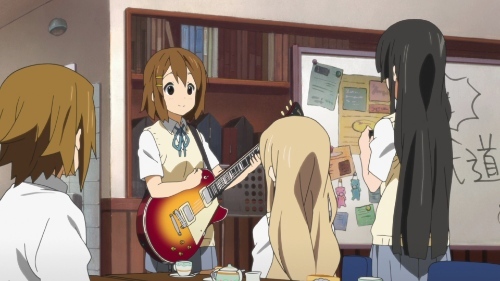 What ensues is Yui's flunking of her exam because she was too busy playing with her new guitar, and her subsequent week of studying so she can retake it, much of which is occupied by… playing with her new guitar. I should be doing this assignment but here I am taking about an already syndicated anime series, I can empathise! Now here's where the scary plot-twist stuff starts to set in. 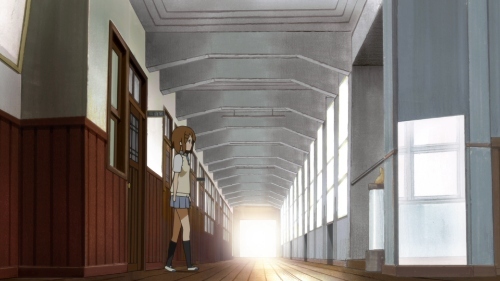 Technically their school won't allow people retaking exams to partake in club activities, so if Yui fails a second time she'll have to stay away from the club indefinitely which means once again they'll have insufficient members to stay active and they'll fold. Game over, no more series! Fortunately Yui is still able to come and enjoy Tsumugi's bean deserts :). "X & Y? Yeah that Coldplay album messed me up!" Well the week goes by and it turns out Yui has done very little stuyding at all (no, really!?) so they all end up sitting with her in her room until late in the night helping her cram… oh wait, sorry Mio I mean "study". During that time we're introduced to Yui's younger sister Ui who's more mature than her sibling! I can relate, my younger sister is more mature than me! So far this could be my favourite episode because it tackled such a mundane problem we all seem to face, and the characters still refuse to be pigeonholed. Mio in particular is the stereotypical shy bookworm but she also vents frustration rather than just blushing like so many others would in her situation. Newer post ← 2000 posts and a TweetDeck desktop!